My ears strain to hear beyond the rush of water against my head, my eyes squint to find my bearings, and my nose allows the gentle but uncomfortable rush of water to seep into my nostrils like a faulty valve. No, I am not drowning. 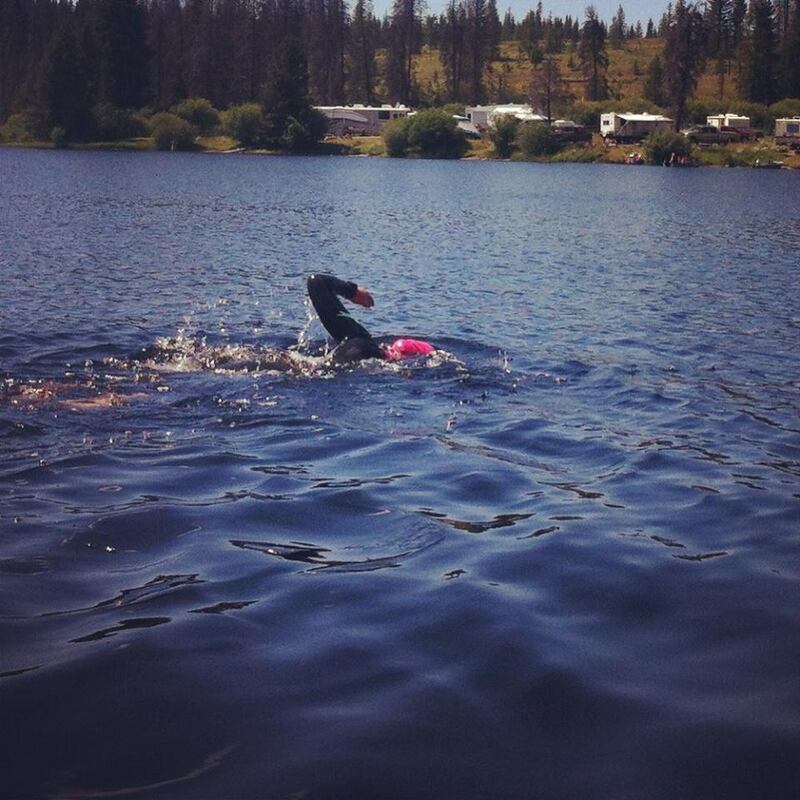 I am a fish just gliding through my natural habitat, and this is the glory of open water swimming. At times the water is so murky all I can see is my hands in front of me, and sometimes it is shallow and bright enough that the entire lake floor bed comes alive. It’s these moments when my stroke pace slows and my imagination becomes lost in the underwater world beneath me. Dead trees look like dinosaur fossils, dancing shadows look like mythical creatures, swaying plants look like an underwater jungle, and your eyes dart from side to side looking for something new and wondrous to see. About every 300 metres we stop to reflect and re-focus our form. I focus on the beauty around me; just a bobbing cone-head so small and insignificant to the rest of the watery playground before me. You simply cannot beat these hot summery nights on the lake. Loons float effortlessly along the glassy surface, a mother hawk tends to her young in a nest high in the trees, and a beaver dives back into his watery home. Thinking back to my training in the pool makes me loath the return of winter. Boring and bland black lines on the bottom of the pool, strange floaties that you know came from bodily fluids, blue painted bottom, chlorine hair and smell; it just isn’t the same. Tonight was my fifth open water swim and we boogied for about an hour and a half across the lake before cutting back behind an island, to make the final drive back to shore. It was a tough swim, and the final 300 metres looked long. I was already starting to feel tired and my arms were not as keen to power me through the water. I felt my form start to waver, my legs started to feel heavier and the shoreline seemed further and further away. Yet I continued to power onwards, until finally I could see ground again. With each stroke my fingertips got closer and closer to the bottom until I was touching down on solid ground for the first time in over an hour. Like a baby fawn, I clumsily stumbled to the shore, glad to be back where we began. Before tonight, my furthest swimming distance was 800 metres in a pool. Before tonight I had a hard time fathoming swimming much further without sputtering, flailing, then subsequently drowning. Tonight I swam 2.2 kilometres. Tonight I discovered that if thrown into the middle of a lake and given the choice of sinking or swimming, I was going to swim. I was exhausted, and slightly wobbly and dizzy, but as I collapsed onto the sand and gazed up at the blue sky above me, I smiled knowing that nothing will be impossible on my road to one hundred forty point six miles.